Unless you have been living under a rock, you are probably well aware of the rising incidences of special needs in our world. Autism, ADD, ADHD and other developmental delays are so prevalent, we are experiencing a nation-wide shortage of occupational therapists. What does this mean for you? First, you should be on the lookout for any developmental inconsistencies in your child. The earlier you recognize a problem and get help for it, the better off your child will be. For this very reason, we have federally funded “early intervention” places that provide services to special needs children under the age of 3. In fact, many children can overcome their diagnoses through therapy. I have a friend whose son was recently evaluated after years of therapy for Autism, and they decided he no longer qualified for the diagnosis. Amazing. In addition to getting the help the child may need, it’s also important for parents to understand their child’s special needs as they decide how to raise the child. If parents do notice any inconsistencies, they can take them into consideration in their obedience training. When you think of a child who has been labeled as being “special needs,” you typically imagine a child whose developmental delays are plainly obvious to the untrained eye. You think of a child who is very low functioning. In reality, most “special needs” children don’t make their diagnoses well known. In fact, there are times when my son is acting out in public that I wish he had a sign on his head announcing his diagnosis so people would be more understanding. It’s this misunderstanding of the term “special needs” that makes it so difficult for parents to accept. The diagnosis itself (piece of paper from a doctor) doesn’t fundamentally change who the child is, nor does the classification of “special needs.” Yet many parents resist the notion simply because of the stereotype. pursues the diagnosis because, although it’s difficult for any parent to think their child may be less than perfect, mom knows that getting help is in the best interests of the child. Most of us are familiar with Autism, ADD and ADHD. Sensory processing disorder (SPD) is less well known, but possibly much more prevalent. In fact, many kids with Autism, ADD or ADHD also have sensory processing difficulties. Although you wouldn’t know it by looking at him, my eldest, William, has two special circumstances that my husband and I must consider. He has sensory processing disorder and gifted tendencies. (The giftedness is nice, but it must also be treated as a special need since it lies outside the framework of a “neuro-typical” child.) If you’re unfamiliar with sensory processing disorder, it basically means that there is something misfiring in his brain when it comes to all seven of his senses. difficulty with proprioception. The seventh sense is the vestibular sense. This affects the part of the brain that makes us dizzy. There is so much to this disorder because a child can be under-responsive, over-responsive or sensory seeking in each of the seven senses. Typically, a child with SPD will show several sensory-seeking tendencies. He will mouth objects (well past the baby phase), have difficulties sleeping, react with a fight or flight response to the most minor touch, display hyperactive tendencies, react strongly to an itchy tag on the back of his shirt, cover his ears at the slightest loud noise, have a melt-down over the seams in his socks, and more. My son has displayed all of these tendencies at one point or another. attention with physical touch, getting eye contact first, not requiring a verbal response (from a child with a speech delay) and using visual cues. him. When we are in noisy places like restaurants, he typically shuts down. His gifted tendencies play into this as well. His imagination and daydreaming make it difficult for him to focus on the world around him. This is sometimes incorrectly attributed to the inattentiveness commonly found in ADD. As if that weren’t enough, William’s SPD affects his impulse control. If we are out running errands and his senses are on overload, I need to watch him like a hawk. 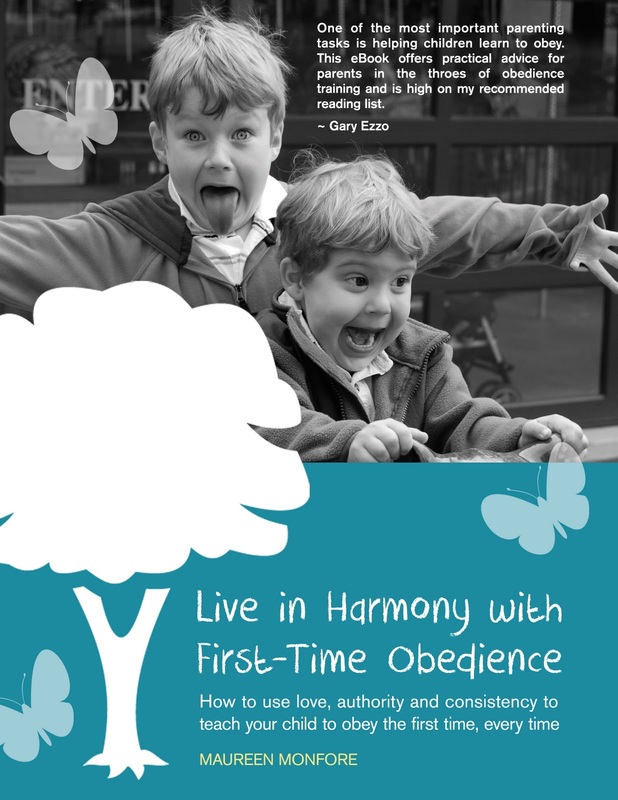 You can learn more about teaching first-time obedience (to special needs and typically developing children) in my eBook titled, Live in Harmony with First-Time Obedience: How to Use Love, Authority and Consistency to Teach Your Child to Obey the First Time, Every Time. for 30% off! On January 9, the price returns to its normal cost of $9.99. Click here to get your copy at this special price. Previous Post Poll Results: IF YOU BREASTFED, HOW LONG DID BABY NURSE TOTAL PER FEEDING AGES 5-8 WEEKS?